One of the members of my partner’s online community recently asked me about detachment. She had just learned about the concept of detachment, and wanted to know how she could stay connected to her husband in the way she wants to—and the way her faith encourages her to do—while at the same time being detached. This is such a good question, and one that’s not simple to answer. The idea of being objective or aloof in your most intimate relationships is less than appealing. Detachment conjures up images of being uncaring, avoidant, dissociated, or emotionally cold. However, detachment can be a powerful, freeing experience provided it’s done as an act of self-care, or even as an act of love for the person you’re detaching from. Detachment is the art of accepting powerlessness—and experiencing serenity—especially in difficult situations. In relationships impacted by addiction, it’s crucial that the partner or spouse of the addicted person understand detachment and how it works. It is possible to practice detachment and love your partner at the same time. When an addict is going through withdrawal, lacks empathy, or doesn’t validate you, you may—understandably—want to keep your distance. This is healthy! And it’s entirely possible for you to observe him struggling or otherwise being difficult, and at the same time feel love for him, and practice detachment. I like to use a concept I learned from Drs. John & Julie Gottman for how to think about your partner when they’re not being who you’d like them to be. The Gottmans say that most couples in conflict see each other as the enemy. Rather than think of your partner as the enemy, they recommend seeing her/him as an “irritating friend.” When you see—and relate to—your spouse as an irritating friend rather than the enemy, you’ll feel more gracious, flexible, and forgiving about minor annoyances or enduring negative characteristics (that aren’t deal-breakers, of course). Accepting powerlessness is the key to detachment. When someone you love is making choices you don’t like—and making a request of them isn’t an option—you are powerless over their choices. In cases like this, detachment is really the only healthy, sane option. Essentially, you let go with love. Otherwise, you’re attempting to have control or power in situations where you have none. When you’re practicing detachment—rather than avoiding or punishing—you’ll feel calm and serene. Healthy detachment is not about avoiding or punishing the other person. Feeling calm and serene while detaching is one of the key signs that it’s healthy and part of your self-care. Because you’re in touch with and accepting of what you have power over and what you don’t, you’re in a much better position to experience serenity and peace about your situation. Rather than viewing detachment as disconnection or lack of concern, see it as part of healthy boundary work. 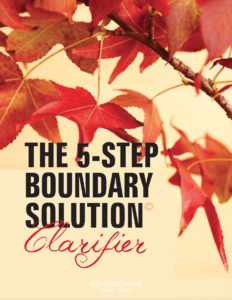 When you’re practicing detachment, you understand there are limits (boundaries) around how much you want or need to be connected to another person—even your intimate partner. If you’ve been in the habit of care-taking your spouse or doing for him what he should be doing for himself, you are practicing healthy detachment when you stop care-taking so that he can take 100% responsibility for himself. When a person stops enabling an addict, it is a deep and powerful act of love. If you’re repeatedly experiencing conversations that feel crazy-making or leave you feeling like you’re in a fog, your choice to physically or emotionally detach from your partner is a healthy response. Terry Real, in his work with couples, talks about “staying connected in the face of disconnection.” In times of unresolved conflict or relationship roadblocks, detachment is one of the best ways to both practice self-care and stay connected with your partner. You see the situation for the way it is (acceptance), refrain from reacting or other non-relational behaviors, and practice self-care all at the same time.